One ancient landmark is a recurring theme on an Austrian cruise, writes Keith Austin. This is no bad thing. There’s nothing quite like rounding a bend on the Danube in the golden pastels of early morning and watching the remains of some romantically crenellated castle waltz into view through the mist. After all, without these architectural blasts from the past, we’d be sitting on the top deck of the Avalon Visionary saying “Oh look, a hill”. Perhaps the most impressive of these is the grey stone pile poking out of the treetops above the sharp loop in the Danube at the Schlogener Schlinge (try saying that after a schnapps or two). It’s impressive not for its architectural prowess but for the vertiginous knoll on which it stands. 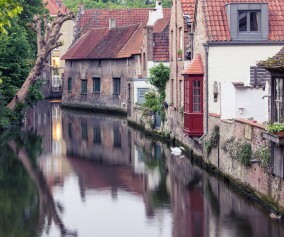 It was used, says our ponytailed guide Sebastian as we stand on an equally steep hill on the opposite riverbank admiring the teardrop-shape switchback of the river, to control the waterways and impose levies on ships that wanted to pass. Unusually for a river cruise, we have arrived at our bosky vantage point pretty much under our own steam after a hike through quiet farms, neatly ploughed meadows and shadowy woods shot through with shafts of sunlight. 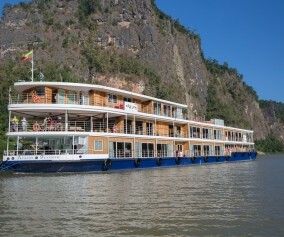 The hike is part of Avalon Waterways’ new Active Discovery program, which will be rolled out between July and October next year. 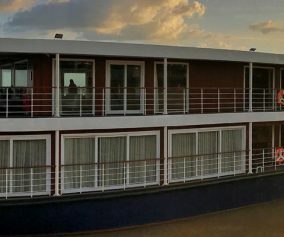 Designed for the increasing number of river cruises who want a more invigorating experience than the usual jump-on, jump-off coach excursions, this means that paddling, climbing, cycling, jogging, hiking and, I kid you not, waltzing are on the menu. And if that’s not enough, the actual menu will include hideously healthy offerings – local produce, small farms, paddock to plate, seasonal yadda yadda yadda – from rising Austrian culinary stars Leo and Karl Wrenkh. Usually, when words such as “wholesome”, “nutritious” and “vegetarian” are thrown into one sentence you know you’re in for food that would take even the hardiest of ruminants a week to digest, but the Wrenkh brothers might have achieved the impossible because their food is delicious. 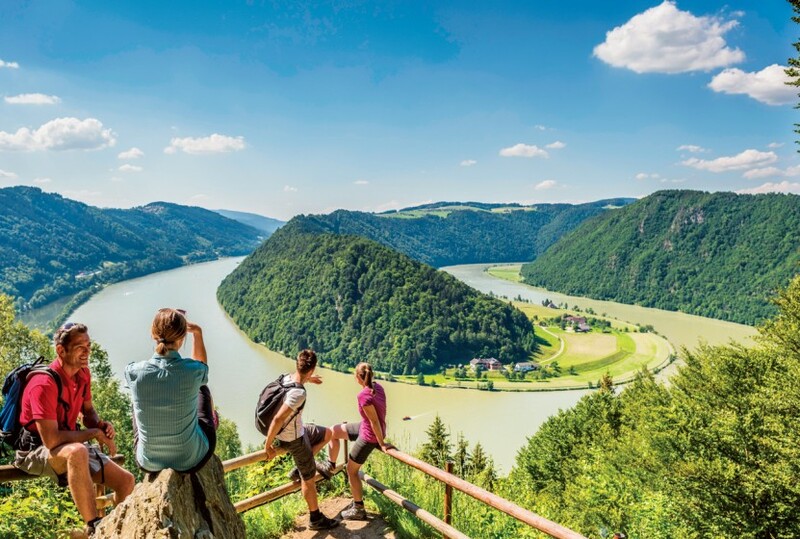 We are on board the Avalon Visionary to get a sneak peak at the Active Discovery program and are piggybacking on a deluxe five-star golf-themed cruise from Vienna to Passau, just across the German border, via Durnstein, Melk, Grein and Linz. The action, though, starts before the ship even leaves Vienna, with a walking tour of a city that seemingly doesn’t “do” ugly buildings and lunch at the Wrenkh brothers place after a cooking masterclass in which Leo Wrenkh shows us just what you can do to a pumpkin to make it edible. The next morning, it’s pouring with rain so the three-hour cycling tour of the city is cancelled due to lack of interest and instead we head for the Atelier Andante cooking school for a few hours baking such traditional Austrian delicacies as mohnflesserl, handsemmel and salzstangerl. All of which taste better than they spell. They also, I notice, run strudel seminars. It’s hardly Active but it is fun, given that there’s a deluge outside and, if you knead vigorously enough, you can feel those triceps beginning to harden. Our teacher is Nabiel Elissi, a big bearded bear of a man who is funny, arch and encouraging all at the same time. Even the dodgiest handsemmel is praised to high heaven, though the less said about my mohnflesserl the better. Our baked bread, by the way, is all taken back to the boat and served with lunch. Nobody dies. In the afternoon there are several choices: visit the famous Spanish riding school, be shown how to conduct a symphony or learn to waltz. I choose the latter because the Austrians are waltz crazy and I think it might work off some of that last salzstangerl. We are driven back into a drizzly Vienna and find ourselves on the top floor of a building that looks nondescript but, inside, is anything but. There, in a beautiful room with a high ornate ceiling and plain parquetry floor, we are introduced to Thomas Kraml and his wife Bianca, of the Tanzschule (dance school) Kraml. It seems this absurdly handsome couple are going to teach us to waltz. What they did wrong in a previous life to deserve this is anybody’s guess but, with the help of a bemused classical quartet on a raised dais at one end of the room, they give it a red hot go. Thomas Kraml, it turns out, is famous for being on Austria’s Tanzing (I know but I can’t help myself) with the Stars and he proves to be an excellent teacher. By the end of our hour or so my dance partner and I are putting in a few turns and have finally stopped treading on each other’s feet. Bianca Kraml is moved to point out that I am “a natural”. This means one of two things: “You are a natural” means something very different in Austrian, or she is blind. The ship leaves Vienna at 11 o’clock that night and by early next morning we are easing our way towards Durnstein past the sort of bridges that stiff-upper-lipped Englishmen are always trying to blow up in World War II movies. We are in the Wachau Valley, a magnificent green swath of vineyards, apricot orchards, dry stone walls and granite outcrops. The pretty villages we glide by are full of steep-angled, red-roofed houses and there is what looks like, yes, yes, a castle on a hillside. At the village of Durnstein, where we have moor in the morning, there is a beautiful blue-and-white baroque church and, you guessed it, the ruins of a castle on the hill behind it. Burgruine Durnstein is pretty much a pile of rocks these days but its big claim to fame is that King Richard the Lionheart was imprisoned there for a while in 1192 until the English paid, well, a king’s ransom to set him free. 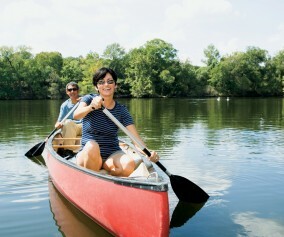 You can walk up to the ruins if you want but we have other fish to fry in the shape of a canoe trip. A minibus takes us a few kilometres upstream where we meet local guides who have lashed together four canoes with wooden planks to make two 21st-century Tom Sawyer-like rafts. It’s not what I was expecting to be honest, and the two Canadians in the group have filched the only unlashed canoe on the grounds of … Canadian. Still, it means Avalon isn’t going to lose any guests to the Danube anytime soon and we push off into the stream to paddle back to the boat, only to find that paddling (we are following a guide who is on a stand-up paddle board) is almost optional, given the river flow and wind at our backs. It’s not a bad way to spend a leisurely hour or so – and the comedy dismount by one of the group at the end of the journey more than makes up for any disappointment at the lack of real canoeing – and an accidental wet bum never gets old, if you ask me. Our next Active Discovery, er, activity is cycling. This is pretty popular, with almost 30 of us setting off for the 30-kilometre journey to Melk, where we will meet up again with the ship and tour the truly astonishing abbey. It’s on a hill above the town, obviously. The cycle ride is sedate, with no strenuous climbs, and passes through some of the most spectacular parts of the Wachau, through cobblestoned hamlets and stands of corn, past orchards of apple and apricot and along back roads splashed with the yellow, violet, white and blue of wildflowers. On the way we stop for Pieter, our Dutch guide, to tell us stories of the churches, villages and, would you believe it, the castles we see on the way. The rest of our particular Active Discovery program consists of walking tours. We visit the pretty little town of Grein, where we tour the oldest theatre in Austria (1791) still in its original condition and the remarkably well-preserved, 500-year-old Greinburg Castle (on the hill above the town, surprisingly). Still the family home of the Price of Saxe-Coburg and Gotha the castle is open to visitors and seems to be where wild animals go to have their heads removed and stuffed. In an underrated Linz we take a walking tour of the city where Mozart composed for a while and where Adolf Hitler, from a balcony in the large main square of what he called his home town (he lived here from the age of 16), proclaimed the Greater German Reich after the Anschluss with Austria on May 12, 1938. In the afternoon, we hike steeply up through tidy suburbs and parks to the Postlingberg pilgrimage church on the outskirts of the city. There is a tram that goes all the way but if you take that you won’t have earned the Linzer Torte and coffee on the charming cafe terrace with panoramic views of the city. Did I mention it’s on a hill?